Peacelink Live!, Grateful Generation, Electric Soul L.A., and MuzArt Foundation are proud to present the Relief for Nepal Concert and Campaign to raise funds and awareness for those recently affected by the devastating earthquakes in Nepal. Who: Confirmed attendees, participants and host committee members include Adrian Grenier (Entourage), Shadoe Stevens (America's Top 40, Late Late show with Craig Ferguson), Ed Begley Jr. (Arrested Development, This is Spinal Tap, Pineapple Express),Jaime Gomez (Training Day). 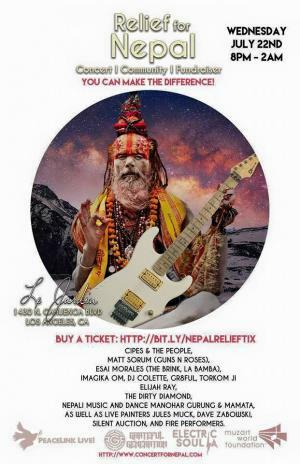 The event will also feature music by Cipes and the People, Matt Sorum (Guns N Roses), Esai Morales (The Brink, La Bamba), Imagika Om, The Dirty Diamond, tradition Nepali music and dance, as well as live painters, a silent auction and fire performers. Where: Le Jardin, Hollywood, Ca (the new outdoor vicinity of Lure-formally Club Ivar), which just relaunched in June and was donated by the Sunset Entertainment Group. Let us know if you have any questions and thank you for your consideration of this worthy cause. Your participation will help to make a difference in the lives of the people of Nepal. This is a charitable 501c3 event.